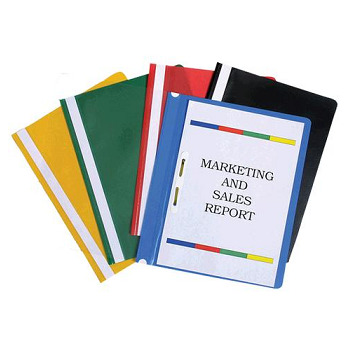 Economically priced A4 files for reports and projects. Just punch your papers and insert using 2 prong fastener. Clear front cover to highlight your contents. Full length title strip so you can identify and title your contents. Pack of 10 x A4 Economy Flat Files. 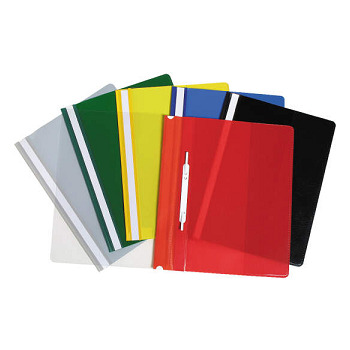 Deluxe gloss finish A4 files with a clear front to highlight your front page and colour back cover with vertical back pocket (on inside cover). Full length title strip so you can identify and title your files. 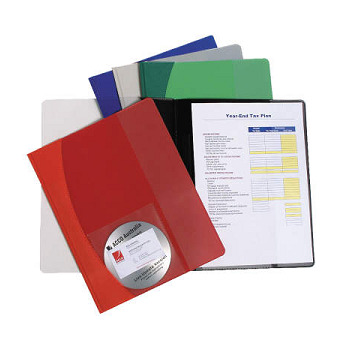 Pack of 10 x A4 Deluxe Flat Files. Semi-rigid A4 size premier flat files with a clear front cover. Inside back cover with vertical pocket, CD/DVD holder and business card holder. Features a slide bar over a 2 prong fastener to secure pages and enhance appearance. Extra wide to cater for sheet protectors or indices and dividers. Price each - Order 25 to receive a pack.